The tiny church is C12, unchanged but for a C13 doorway and later windows. There is no village, just a farm and a modern house that replaces the rectory, and the church is surrounded by trees. Since 1510 the living has been united with Greatham. The single-cell church is built of rubble. The date of the walls is best indicated by the relatively broad proportions of a blocked plain round-headed north doorway, which is C12. The two heavy tiebeams of the roof are early in date, quite possibly of the same time. The moulded south doorway is C13 and the square-headed windows are early C15. The south ones have one light and may mark the positions of the original ones; the west and north ones have two. The east end in the Sharpe collection drawing (1805) is in shadow and unclear, but it seems to show a four-light east window with a square head which looks C15 and is clearly related to those in the nave. This differs from the present one, which is larger with a pointed head and only three lights, with rather heavy panelled tracery that is certainly not original. It was inserted before 1849, when Adelaide Tracy drew it (II p83) in its present form. 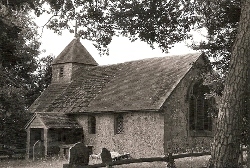 The roof is half tiled and half of Horsham slabs, and the date of the plain, shingled bell-turret is uncertain. The largely C19 interior has simple fittings, including boards with the Commandments, Creed and Lord’s Prayer on both east and west walls. These boards were probably done when the east window was replaced and as this is unlikely to have been long before 1849, they are late examples. In 1877 the south and west sides were underpinned and the roof stripped of plaster (CDK 1878 pt 2 p87), but no name is recorded. A further restoration in 1952 by A V Heal (WSRO Par 209/4/3) included a plain porch. There is still no electricity, so lighting is by oil lamps and candles. Altar rails: (Part only, now across west end, dividing off the western third of the church) C17. Font: Late C12 square bowl of Sussex marble with five arches on each side. Its excellent state of preservation suggests it has been retooled and the present thick stem is unlikely to be original. 1. (East window) J Powell and Sons, 1859 (Cash book). A single medallion in the centre light has striking colours, including purple, grey-green and steel blue. The rest of the window comprises grey and red patterned quarries. 2. (West window) J Powell and Sons, 1861 (ibid). The patterned glass is similar to that in the east window though more elaborate. Mass dials: (South west corner) Two fine ones, with more detail than usual. 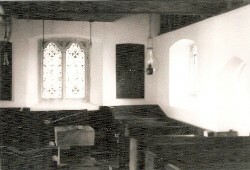 Pews: The pews for the principal residents are at the west end, behind the font. Probably C19, the position would have been acceptable in so small a church.